Cut the broccoli, onion and celeriac into small pieces. Peel, core and mince the apple. Set aside. Heat the ghee over medium heat in a large saucepan. Add the cumin, anise and mustard seed and stir-fry gently until the mustard seeds begins to pop. Now add in the vegetables and coriander and sauté for 2 minutes. Next add the vegetable stock and the coconut. Bring to a boil and leave to simmer for 20 minutes. 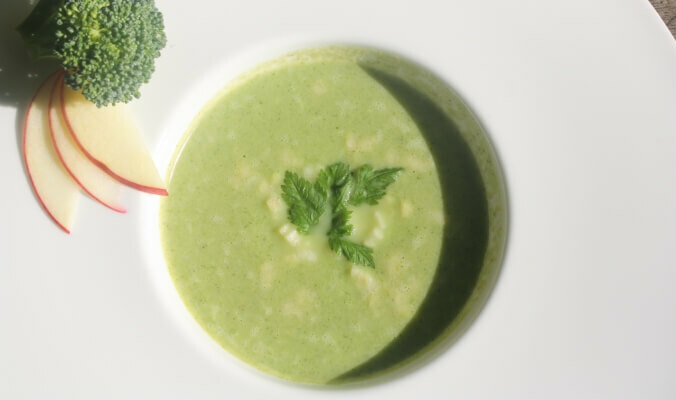 When the vegetables are cooked through, puree the soup until you have reached a very fine and smooth consistency. You may want to add more stock if the soup is too thick. Season with salt, pepper, lime juice and a little bit of brown sugar. Stir in the diced apple and serve.